It’s fitness time and always a good time for a stainless steel bottle with your logo. The Cordova is a 22 oz is constructed of 18/8 stainless steel with a matte black finish. 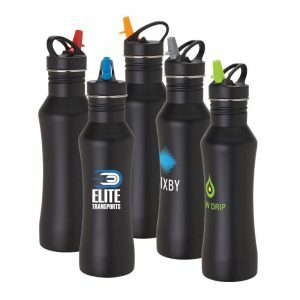 This bottle features a colored flip up drinking spout with straw, an integrated carry handle and is BPA-free. Min is 96 bottles at 8.49 ea, 240 at 7.99, 480 at 7.49 or 1997 at 6.49. Set up is 56.25. Imprint is one side: 3″ W x 1″ H. Item number KW1502.